Bearing in mind the difficulty of finding and shipping lipos I would rather Emax charge a little more and supplied more packs especially when they don't really specify many details on the lipo required. 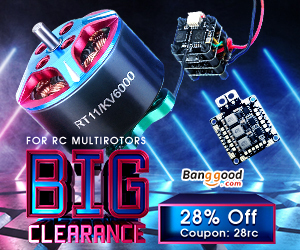 Get the Emax Tinyhawk on Banggood, it's currently on discount. The ESC, FC and RX are integrated in a custom board that fits the quads profile. On top sits the camera and VTX components. All antennas stay protected within the main canopy. Technically the Tinyhawk is up to the standard of modern mini quads with an F4 processor, an OSD and remote channel changing through smart audio. Little details such as a cut out to access the USB port/vtx button or plugs allowing you easily replace motors show how much thought Emax's design team have put in to this product. Everything is easy to access and work on if required. Setting up the Tinyhawk for flight was easy, I simply had to bind it to my Taranis using D8 mode and configure my modes in Betaflight. It's worth noting that non FrSky users will have to add their own receiver. There is a spare UART provided but not much space to put one. In all honesty unless you are an expert I would recommend this for FrSky users only. Tiny Whoops are something very special and have a whimsical charm to them. They are the kind of quad you can fly round a room, cause a bit of mischief and leave with everyone smiling. Any increases in size, weight or performance risks loosing the Tiny Whoop magic that makes them so addictive yet harmless to fly. The problem with this is that a Tiny Whoop doesn't fly in the same way as a regular 5" quadcopter. They are docile little things that feel closer to toys in their own little category. The Tinyhawk way designed to feel more like a 5" quad in a smaller size whilst retaining it’s whoop level of fun. I'm really pleased to say that for the most part the Tinyhawk solves this. I was able to fly it at good speeds both indoors and outdoors whilst still retaining a good level of control along with the fun factor. It was perhaps not as easy to fly indoors as the TinyWhoop but was not far off even in acro mode. Outside or in larger spaces it was fantastic and held up against a little bit of wind. Acro wise you can do rolls, dives and power loop manoeuvres but I wouldn't call them comparable to a 5". I found that the Tinyhawk lacks the power to catch itself compared to the 2s micro quads. It's fun to fly in acro mode and a great trainer but I would recommend it for more a cruise or race style of flight. In terms of feel, I would say that it felt more like a 5" as long as you keep it the right way up. The inverted design of this quad puts the centre of gravity above the prop line which allows it to roll and bank on corners with ease as opposed to the pendulum effect you get on a Tinywhoop where the weight acts against your movements righting the quad. Battery life was ok at about 3 minutes but not anything to shout about. Toward the end of the packs you can feel the quad loosing power. Sadly no quad is perfect and the Tinyhawk does have I few problems I will cover briefly. None of these are a deal breaker but are good to be aware of in advance. No Anti Turtle mode. Anti turtle mode is a clever little feature that allow an upside down quad to right itself by spinning the propellers in the opposite direction to normal which rolls it back over. You can enable this mode on the Tinyhawk but sadly it is not powerful enough to flip itself back over. Emax say that they are releasing a four bladed propeller to fix this issue in the future but for now we will have to walk to flip our upside down quads. Battery Availability. I can only speak in regards to the UK on this but for us the battery availability has been poor. Many retailers who sell the Tinyhawk do not stock lipos for it and ones that do charge far more than they are worth. I know a few people with Tinyhawks who were disappointed not to be able to fly them over Xmas and proposed events had to be cancelled in light of this. Fixed camera angle. To be honest I haven't minded this and have had no problems with the camera or it's FOV for close quarters flying. However I have heard of some users wanting an adjustable camera option without having to resort to DIY mods. I would recommend the Tinyhawk primarily to beginners due to it's ease of setup and durability. It is easy to fly but still has good performance as you progress. Seasoned pilots will enjoy using it as long as they don't intend on doing big acro manoeuvres. The Tinyhawk makes a great trainer over the Winter for the times when it’s just too harsh to fly outside.